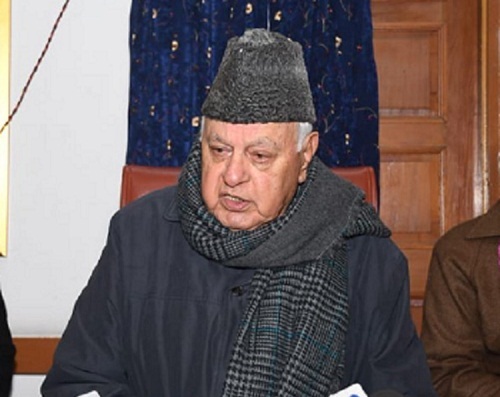 Srinagar, February 08 (Scoop News)-Jammu and Kashmir National Conference President Dr. Farooq Abdullah on Friday expressed hope that the new government in New Delhi will open parleys with Pakistan saying only time bound, result oriented dialogue offers the way forward to the protracted issue of Jammu & Kashmir. On the occasion party president welcomed PDP district president Baramulla, Bandipore Irshad Rasool Kar and a prominent Peoples Conference functionary Abdul Rahim Lone into National Conference. “The need of the hour is to make party stronger at grass roots in order to put up strong front against those forces as are inimical to the state’s special position. I am convinced that the new entrants into our party fold will employ their political acumen to make party stronger at the grass roots,” Dr Farooq said. Party vice President Mr. Omar Abdullah was also present at the event. Expressing concern on steep increase in the airfare of airlines operating to and out of Kashmir, he said, “It is reflective of the attitude of the central government. Given the fact the landing charges and the fuel charges are stable; I see no reason behind the steep increase in air fare,” adding, “I have time and again taken up the issue with the central government and will do it again. I have also impressed upon Union Minister for Road Transport and Highways Mr. Nitin Gadkari about the need to upgrade the road connectivity between Jammu and Srinagar,” he said. Recounting the achievements of NC led government in 1996; he said, “The reason why my government was able to achieve multi sector development goals was due to the fact that I had a majority in the assembly. We were able to usher in an era of development from 1996 to 2002 notwithstanding various problems that we were facing then,” he said. Among others provincial president Nasir Aslam wani , Treasurer Shammi Oberoi, North Zone president Muhammad Akbar lone, Qaisar Jamsheed Lone, Javaid Dar, Dr Sajjad Uri, Basharat Bhukhari, Shabir Mir were also present on the occasion.